What is Third Chair ministries? ThirdChair ministries is the expression of Roy & Christine Cochran. We believe God has invited us to take this next step with Him in loving people, in helping them discover and deepen their personal relationship with God, to gain an identity as sons & daughters being loved by a heavenly Father and to manifest that love into their world. The specific people group of our focus is and has been the creative community of people known as artists. We believe that through ThirdChair, God desires to encourage artists to make room for the reality of His presence. ThirdChair will be active in setting a table and opening doors for artists, that through their artistic expression, each manifestation of the love of God that overflows their hearts will bring light, beauty, hope, healing and love into our world, into our communities, into our churches and into our hearts. To me, THIRD CHAIR represents a huge shift. A normal shift for anyone in relationship with the Living God. A shift from talking about God to speaking with Him. A shift from learning about God to knowing Him. A shift from trying to live the christian life correctly to simply receiving and letting Him love me. A shift from serving in ministry for Him to being invited to love people with Him. This is the reality that we are leading a growing creative community of artists into, a life with God. A life experiencing Him loving us. ThirdChair is setting a table for the love of God to be at home in the hearts of artists. Providing inspiring, transformative encounters for the creative community of artists, bringing them into their true identities as sons & daughters and encouraging their creative reach in this world as artists, both in the church and outside the church. Each and every week Roy has the honor of giving his time, his talents and his heart to worship leaders, songwriters, film makers, visual artists, technical artists, musicians, producers, authors . . . you get it . . . to ARTISTS. These conversations are the backbone of our ministry. It's where transformation happens in the loving environment of real relationship. Roy's reputation of love, experience, safety and his unique heart for artists has invitations and requests for his time coming from all over the world. It's both an honor and unfortunate that Roy's heart to mentor artists is so unique. Our heart is to "activate" as many mentors as possible to join us at ThirdChair in developing the spiritual life & creative work of artists. 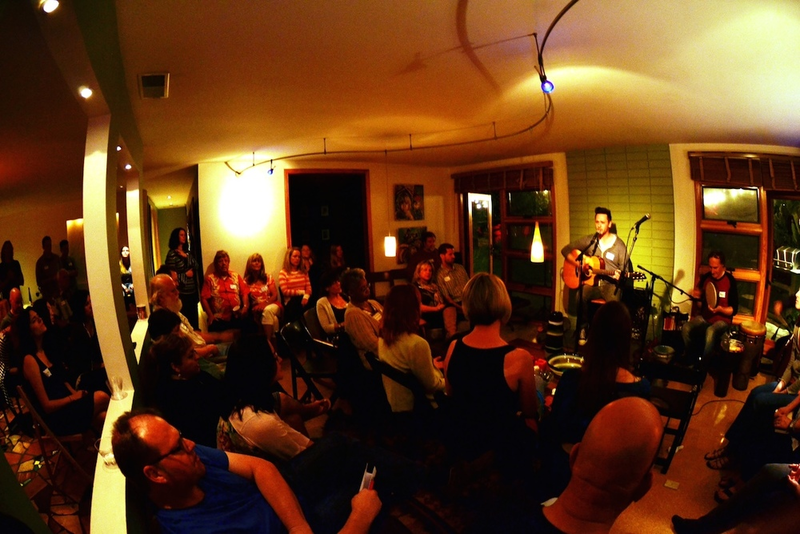 Roy has been curating artists gatherings on a local & national level for the last 10 years. A new season of Gatherings are currently being curated for Southern California called Artist Guild, Party for the Soul & The Artist Table. Artists are invited to come together to share a meal and feed each other's souls. These unique times together are filled with inspiration, love, space and the gift of BEING with others like you . . . with artists who are "all in" with the calling God has given them. These Gatherings have proved to be SO vital to the transformational work God does in our hearts as artists, who so often work in isolation and tend to be introverts. To hear and share each others stories, to be encouraged by another artists, to be mentored, pastored, loved & inspired by seasoned "Sages" is not normal for most artists, including those who serve at most churches. Songs have the unique ability to go right into the heart. Their place and value in culture and in the church are undeniable. Millions of songs are downloaded by millions of people every day. When the hearts of today's songwriters are alive to the love of God AND are skilled at the craft of songwriting, they have the ability to speak into the hearts of everyone who listens. In church, the songs we sing inform our theology as much as any sermon. Today's & tomorrow's songwriters need our help today. Our churches and our culture need music that can speak life into them with beauty & truth. We have vision for a retreat cottage or travel trailer in the backyard of the Cochran's home to give Artists some space during their time of ministry. There is a pretty steady stream of people who come to stay with the Cochran's for short term or longer stays. Many are artists who come for a time of refreshment, for some soul care or just a for visit. God has done TREMENDOUS work in the hearts of those who come to stay with them. Currently, guests stay in their Guest Room in their home.